Our Healthy Pet Club allows you to spread the cost of your pet's routine health care throughout the year with 12 easy and affordable payments covering vaccination against deadly diseases, and increased protection against the wide range of parasites our pets are exposed to every day all at a 15% discount. Dogs - Distemper, Hepatitis, Parvovirus, Leptospirosis and Parainfluenza. Cats - Feline Herpes Virus, Calicivirus, Panleucopenia Virus and Leukaemia Virus. 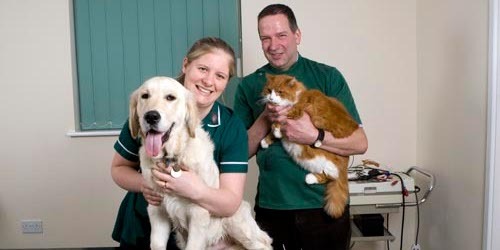 PLUS a 6 month Pet Health Check with our Qualified Veterinary Nurse to keep your pet in tip top health. PLUS Flea Prevention: A convenient monthly spot-on treatment for year round flea control. PLUS Worm Control: An effective treatment programme for tapeworm and roundworm all year round. 10% OFF every initial consultation fee. 15% OFF additional flea treatment. To register for our healthy pet club, simply call into the surgery and complete our registration form. You will need your bank details to set up a direct debit. If you would like further information, our staff will be very happy to help you or answer any questions you may have.